NEW YORK -- Unthinkable as it may be, Stephen Curry found himself slumping. In the first three games of an arduous road trip, he missed 27 of 31 3-point attempts. In the second game, fellow Golden State Warriors superstar Kevin Durant sprained his MCL, leading to two straight losses -- a relative catastrophe in Warriors world -- and putting more pressure on Curry to get back on track. At practice on Saturday, Curry said he just had to fight through the cold spell and not let it affect him. Maybe the team as a whole needed some more ball movement early in games, he said, but it would be OK. Then he missed his first four 3s against the New York Knicks on Sunday, including a wide-open look in the corner. How does the best shooter of all-time regain his rhythm? Does he think about all the seemingly impossible shots he has made, all his huge scoring nights and clutch performances? Does he go through a 20-point mental checklist like Kyle Korver, analyzing every little detail of his form? No. Weber wasn’t the only coach to give him a pep talk. The broadcast also showed Steve Kerr, stat sheet in hand, talking to Curry about his plus-minus and how his misses don’t mean he’s playing poorly. “He was a plus-15 and I think he was like 3-for-11 at the time,” Kerr said. “I know as a shooter sometimes you base everything on whether your shot’s going in, but I just felt like he was giving us a huge boost with his energy and just pushing the ball in transition and putting a lot of pressure on the defense. So I just wanted to remind him that shots may go, they may not, but you’re still having a huge impact on this game. The message from both of them was that Curry needn’t worry about the “problem” with his shooting. To fix it, he had to not see it as a problem at all. If this all sounds Zen, perhaps it’s appropriate. After Curry caught fire in the third quarter and led his team to a victory, Kerr chatted with Phil Jackson outside the visiting locker room at Madison Square Garden. Curry’s strange little lull made headlines, but it didn’t have broader significance. Opponents don’t change their game plans against Curry when he misses a few shots, and he doesn’t start doubting himself or hesitating. Kerr is correct in saying that he doesn’t have to hit shots to help his team -- his mere presence and reputation makes the game easier for his teammates because defenders are terrified of letting him get going. The bigger question about Curry is why his numbers aren’t quite the same as they were. Last season, he averaged 30.1 points on 50.4 percent shooting, making 45.4 percent of his 3s and shattering the NBA record with 402 3-pointers made. In January, Kerr compared that year to Ted Williams hitting .406, adding that Curry was in a “no-win situation” because he had to live up to one of the best individual seasons ever. At first, there were legitimate concerns about how he was fitting in with Durant. Curry wasn’t scoring 30-plus points or launching from 30-plus feet as often as usual, instead deferring in order to make his new teammate comfortable. After a couple of months, Durant directly told Curry to just play his game. In the 2017 calendar year, he’s averaged 26.1 points on 19.9 shots with a 29.8 percent usage rate, per NBA.com. He has been more aggressive than he was in his first MVP season, but not quite as efficient as he was in his second. Kerr credited Curry for learning how to manage the game better and spread the ball around. Curry acknowledged that there has been a change, but described his approach as consistent. There is an idea that, with Durant out, Curry will have an opportunity to go back to his old self and dominate games as routinely as he did when Golden State marched to an NBA record 73 regular-season wins. Kerr knows the team feeds off of Curry when he plays with absolute freedom and launches off-the-dribble 3s, but rejects the notion that he has to alter anything. Curry said the Warriors “don’t change the way we play, but with K.D. out there’s more of an emphasis on especially me and Klay, Andre [Iguodala], Shaun [Livingston] to look to score and push the envelope a little bit.” He is aware that Durant won’t be around to bail out bad possessions, but that doesn’t mean he’s going to try to do things himself. Golden State probably isn’t suddenly going to lead the league in pick-and-rolls, either. The goal, as always, is for movement on offense to generate open looks. When healthy, Durant used possessions that could have gone to Curry, and the absence of a 7-footer who can score from anywhere on the court will change the way the Warriors function. Curry still has to play instinctively, though, and his challenges -- using opponents’ pressure against them, finding seams in defenses designed to stop him, limiting turnovers -- remain the same. Curry knows the attention will be there no matter what. First, it was about how he’d play with Durant; now, it’s about how he’ll play without him. There is pressure to hold off the San Antonio Spurs and keep the top seed in the Western Conference, and there is less room for error without Durant. There might even be a window here for Curry to remind everybody that, at his peak, he can still be the best player in the league. He knows all of this, but he also knows he can’t dwell on any of it. Curry is a rhythm player on a team that is at its best when its offense is flowing. After the past couple of seasons, he is used to the spotlight, the overreactions and the endless questions. The way to handle it is the same way he broke out of his slump: Don’t think, just shoot. 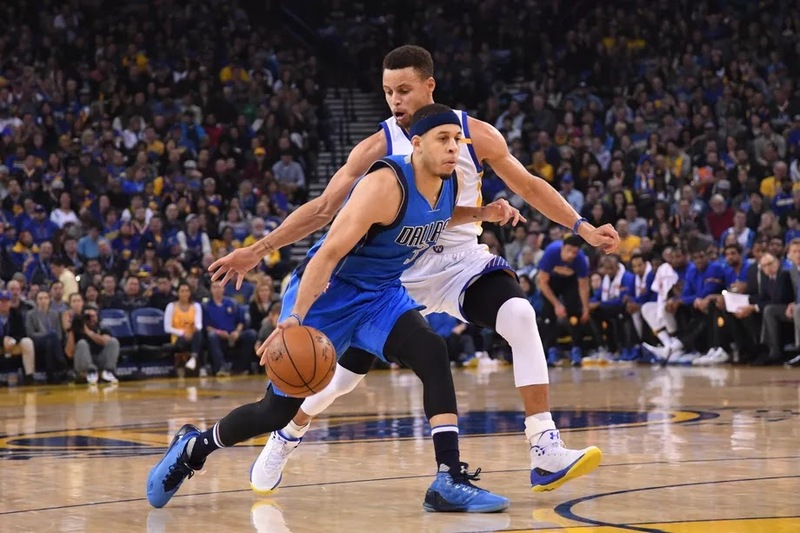 When Seth Curry entered the NBA in 2013, he was seen as little more than Stephen Curry’s little brother. After all, he was only a two- to three-star recruit out of high school and averaged just 14.9 points per game throughout his college career. Meanwhile, the older Curry was well on his way to leading the Golden State Warriors to consecutive NBA Finals appearances, winning back-to-back MVP awards along the way. But Seth Curry has emerged as more than just the younger sibling in the family this season and has had an impressive stretch since the All-Star break to prove it. After the break, the Mavericks waived veteran point guard Deron Williams, freeing him up to sign with the Cleveland Cavaliers. In the six games since, the 26-year-old Curry is averaging more than 23 points per game on 58 percent shooting from the field and 53 percent shooting from downtown. He’s made 14 threes and poured in 29 points in a Feb. 27 win over the streaking Miami Heat. During that same stretch, the reigning MVP is averaging just two more points at an uncharacteristic 24 percent three-point clip. The younger Curry may have sapped his older brother’s superpowers. Curry’s play has helped jolt the Mavericks, who are now just two games behind the West’s eighth seed after winning six of its last 10 outings. But he could have been helping the Kings had they not let him go over the summer. Sacramento signed Curry to a two-year deal two summers ago but declined to pick up the qualifying offer on his contract, allowing him to freely sign elsewhere as an unrestricted free agent. Why? Curry just didn’t want to be there, according to Sactown Royalty’s Greg Wissinger. Curry played sparingly for the Sacramento Kings last season, but played well when he saw the floor. And then this past offseason, when the Kings lacked depth at the guard position, Sacramento renounced their rights to Curry, allowing him to become an unrestricted free agent. The Kings have a tendency of giving away quality players for little to nothing in return. Remember, Sacramento once had Isaiah Thomas, Hassan Whiteside,and DeMarcus Cousins all on one team back in 2011. Of course, Whiteside was believed to have poor work ethic and temperament that led to his waiving in 2011. He now leads the league in rebounding (14.1 per game) and ranks fourth in blocked shots for the surging Miami Heat. In 2014, they sent Thomas to the Phoenix Suns for Alex Oriakhi and a $7 million trade exception. Thomas now averaged 29.5 points per game in Boston, while Oriakhi plays for Garzas de Plata in the Mexican Basketball League. And just moments after the All-Star Game, the Kings sent Boogie Cousins to the New Orleans Pelicans for Buddy Hield, Langston Galloway, Tyreke Evans, and a pair of picks in the upcoming draft. Seth Curry isn’t an All-Star, and its unclear if he ever will become one in the guard-heavy NBA. But he’s no longer just living in the shadow of his All-Star older brother. Moreover, Sacramento will never reap the benefits of Curry’s development into a solid basketball player. Instead, they will watch him become for Dallas what they needed all along on their own roster — a capable ball-handler and shot-maker at either guard position. And that is music to Mark Cuban’s ears. Stephen Curry and Under Armour gave short notice to New York City last Friday about a scavenger hunt for 30 pairs of the extremely limited Curry 3ZERO Gold. Curry used Twitter to share the rules and then to give the clues on Saturday morning. After all 30 pairs had been found, the winners got a chance to hang out with the Chef at Foot Locker’s NYC 33 space. Check out the gallery above to see a recap. 0 Response to "Stephen Curry's simple solution to slumps, surviving Durant's injury: staying himself"